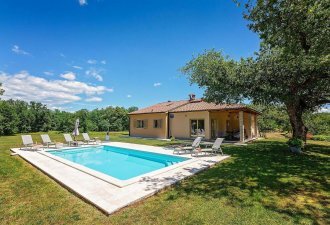 An elegant, sophisticated, 4 bedroom villa with pool is located in the peaceful, pitoresque village on the east istrian coast and only few minutes drive from the beach in Plomin. It is spacious enough to accommodate 8 people comfortably. With 4 bedrooms and 4 bathrooms, villa is the perfect retreat for an entire family or a group of friends. 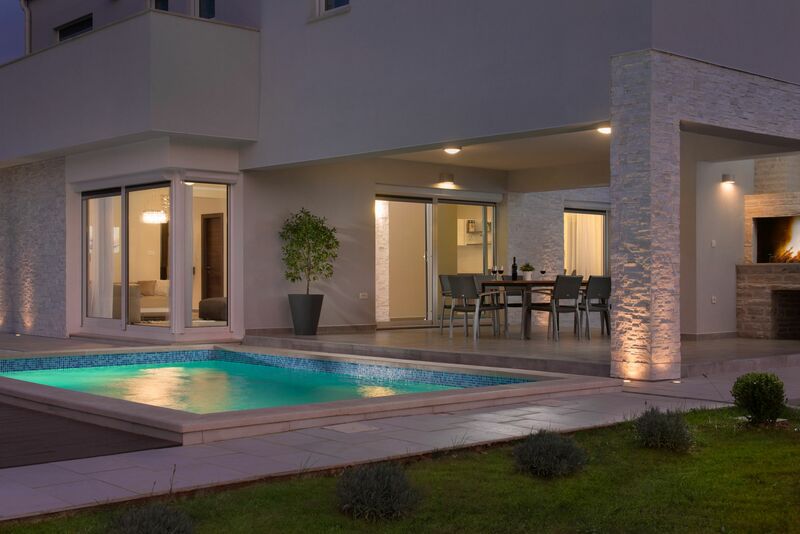 The ground floor of the villa offers a dining room, where you can sit with your family for a relaxed evening, kitchen with all the required utensils and living area that extends to the pool terrace with doors opening up to the gardens. A staircase leads up to 4 spacious double bedrooms,furnished with comfortable beds and all with privat bathrooms. Covered terrace with BBQ and outdoor dining table with pool view provide the perfect location for breakfast, lunch or dinner. For amusement there is a table tennis, table football and sauna.